I hope everyone enjoyed the togarashi mayo rice chips review on Monday. I chose that to offset the utterly bland and typical nature of today's review of a new Christmas donut offering by the fine folks at MisDo. They're offering several flavor variations on this snowman concoction, but none of them is really something to get all worked up about the oddness of. There is chocolate, green tea, strawberry and angel cream. Because none of these is very exotic, at least not for Japan, I went for what I love, angel cream. That is to say, plain old sweetened whipped cream. If you want me to put something in my mouth, all you have to do is slather it in whipped cream... and, no, that's not how my husband won me over. 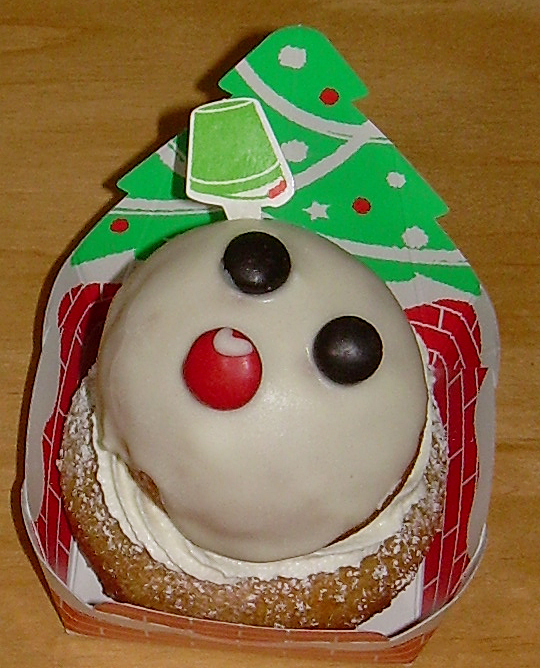 Besides these little snowmen, there are also some vaguely modified versions of other standard Mister Donut offerings such as a churro "wreath" with white chocolate frosting and a few candy-coated bits for holy berries and two (strawberry and chocolate) frosted versions of the venerable "pon de ring" donut with sprinkles. I think that it's probably too much to expect that any chain store is going to invent an entirely new concept for the holidays. It's easier just to slather new frosting on an old one. If it's good enough for Krispy Kreme, it's certainly good enough for Mister Donut. This is actually two small donuts of different types rather than one. The smallness of them is reflected in the fact that the whole thing is still only 253 calories. The top piece is a ball of yeast-raised dough with frosting and some supremely sweet cherry-flavored M-&-M-style candies on it. When fresh, it's a nice enough morsel, but a little too sweet for my tastes. The bottom isn't actually a donut, but rather a chou. If you don't know what a chou is, then you haven't lived in Japan in which chou cream are everywhere and the results of a long ago food fad. It's an area, slightly tough and chewy pastry which seems mainly geared toward acting as a receptacle for cream or pudding. The chou base is pretty much like every other consumer-level chou I've had in Japan and as I described it in the aforementioned paragraph. 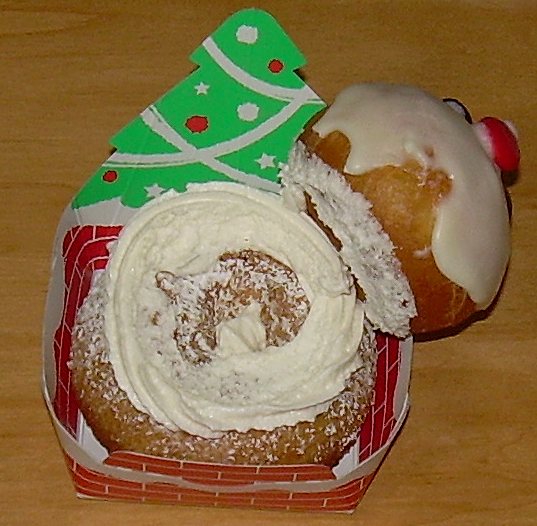 A "scarf" (or "wreath) of whipped cream cements the top and bottom together and about 1/3 of the chou donut has cream in it. The rest is just plain old chou. I don't know if this is how it is supposed to be or if I got a defective one that had cream inside that it shouldn't have had or lacked cream throughout the interior as it should have had. Experiences like this are hard to rate because this was a pretty nice donut. I enjoyed eating it, but given the other options, I wouldn't buy it again. That assertion is a reflection of how much I like other donuts, not that there is anything bad about this at all. 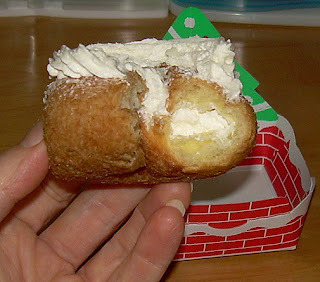 The regular angel cream at Mister Donut has as much whipped cream, fewer calories, and has a more tender donut exterior which is superior to either of the donuts in this concoction, but I certainly did enjoy this so it gets a "happy", despite my feeling this is the last time I'll sample this. I miss Misdo :( The Snow Doll Donut looks perfect for Christmas in Japan.